The Health and Wellbeing Pathway map is a good visual prompt for what needs to be thought about and planned for so that young people have their needs met and so thought can be given, in advance, to all areas of their lives affected by having additional needs and leading to fulfilling futures. • To have good planning shared with adult health services and GPs giving them enough time to prepare for any transition and helping GPs ask the right questions at annual and other health check. • if necessary know that other people understand how they communicate and how to communicate with them. Young people can and should have a strong voice and focus on their hopes, aspirations and goals when preparing for adulthood, this is called person centred planning. Young people with disabilities and complex health needs should have any health needs described in their Education, Health and Care Plan (EHC Plan) or when planning for transition to adult life, and for some but not all young people, specialist adult services. Their needs should be discussed and reviewed regularly with local health services who can help prepare and guide them through the process (for example the Ready Set Launch planning tool). You can ask your local or other health providers involved in your care, to explain how transition planning is managed within their area or specialism. Transition planning is better and more meaningful for young people and their families if all aspects their life are considered, and the young person is involved throughout. 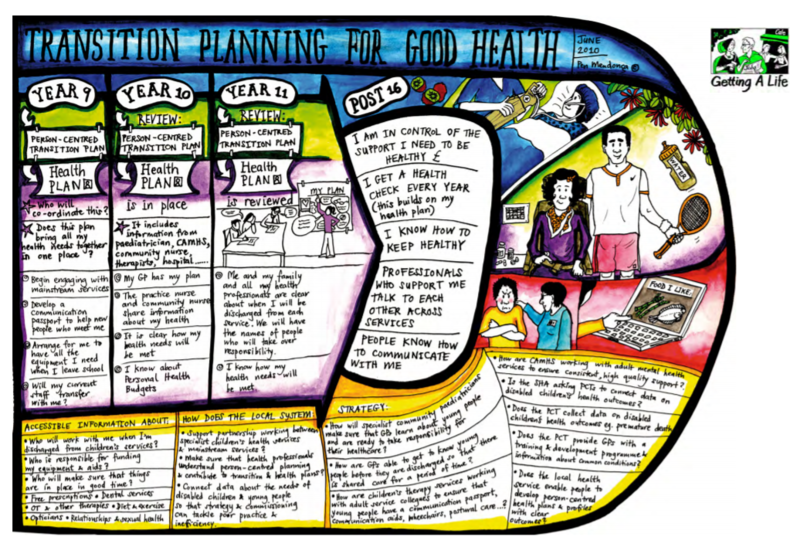 Using Person-centred approaches to health planning with young people are important to success. In Hackney local health service aim to work in partnership with the young person and their families when planning for adulthood and to review if things have worked well or need to change. Hackney Captains is a group for young people with additional needs dedicated to helping improve the Hackney Ark for themselves and for other teenagers. In the past young people with disabilities were sometimes not known by their GPs because they had been supported throughout childhood by ‘specialist’ child health services. To make sure GPs do know young people better health checks that help connect young people with GPs and ordinary NHS health systems for example dentists, are offered. These are an important part of moving away from children's services particularly for young people with SEND. The Annual Health check for those with Learning Disability available from Year 9 / when young people are 14 years of age, and the 16 Birthday Health Check are a way of ensuring young people are known to the right adult services. Most disabled young people need to have a much closer relationship with their GPs as they move into adulthood because their GP will now be the health professional who will coordinate their care. Children’s specialist health services in Hackney will work with GPs and other mainstream services to support them with receiving young people into their service. Young people and their families planning for the future need to know what the changes to their health provision will be over the next few years. Annual Reviews are a good opportunity to explore what the issues to consider and plan for might be. For example, some children’s services discharge young people at different ages. It is important for young people and their families to know when they will be discharged, and which service, if any, they will be referred on to. Do you know how adult health services will work with you? If a young person has equipment and/or appliances will there be a change of provider or can keep their equipment? Young people and families should ask about the option of personal health budgets and the possibilities these offer to support fuller more independent lives for those with complex health needs. If there gaps in the current health care system are identified these should be reported up to service managers and commissioner for further action. In Hackney child and adult health and social services are working together to improve pathways and coordination to give young people and families time to prepare for discharge and to meet any adult services who will be taking over their care. Planning tools like Hackney Ark - Therapy Transion's - Ready Set Launch teamplate can help you think about what to ask during your annual reviews. Hackney's Local Offer provides information for services from education, health and social care available for those aged 0-25 with SEND. Short Breaks Hackney offer respite and leaisure opportunities for young people. Hackney i-Care provides information on adult health and care services. In year 9 a transition annual review will be held at school. This is to make sure all your needs are discussed and described in one place to help you with planning for adult life. You should prepare for and attend the meeting with support from your school or settings SENCo, parents, careers advisor and other service providers who know you and are involved in your care and support. Where possible, members of your health team such as school nurse, community nursing or your therapists (Speech and Language Therapists, Occupational Therapists or Physiotherapy) will attend your annual review to join in with this planning. If they are not able to attend they will have provided information and advice to be included in discussion and planning. Start to consider who will be taking over responsibility for your health care in the future. This may be your GP. Planning templates and guidance to help prepare for transition and annual reviews can be found in the documents library. Your EHCP and/or health planning will continue to be monitored and reviewed. Be thinking about what you plan to do after school ends. Will you stay in education, training or work? Where would you like to live and who with? Making sure your independence skills are being developed; self-care, cooking, budgeting, travel skills. If you see a specialist consultant at a different hospital for example orthopaedic services to explain how transition planning is managed within their area of expertise and keep a record of who will take over. Start to consider who will be taking over responsibility for your health care this may be your GP. Start gaining confidence in managing your own appointments and advocating for yourself during your appointments where you can. A parent or advocate can support if needed. If you have complex health needs by this point it is likely adult social services will have started to be aware of you and your needs to start preparing for your transition to their services. A reprentative from adult service may attend your annual reviews. If you have learning difficulties GP annual health check can start when you are 14 years of age. These help your GP get to know you and understand any difficulties that may impact on your health. If you have moderate needs and are not eligible for annual health checks you can link into other services like Young Hackney who have support workers and specialisms in youth services and Targeted Health Outreach Team for people with moderate needs but no social care involvement. Have gained confidence in managing your own appointments and advocating for yourself in appointments as able. Have a understanding about your condition and how to manage your health needs. Have information about how to stay healthy as you get older including: physical activity, health eating, sexual health services, managing social media, drug and alcohol advice services. Your independence skills are developing well e.g. self-care, cooking, budgeting, travel etc. Know who will be taking over responsibility for your health care. This may be your GP. Have met adult services and had an assessment as relevant. Know how/when to pay for any medication. If you have complex health needs you should know be known to the adult social services team who will continue to monitor your care needs e.g. Integrated Learning Disabilities Service. If you have moderate needs and are not eligible for annual health checks you can still link into other services like Young Hackney who have support workers and specialisms in youth services and Targeted Health Outreach Team for people with moderate needs but no social care involvement. As young people move into adulthood, their transition plan/support plan can develop with the help of new people in their life. Planning that took place with young people and their families when they were in children’s services needs to be built on while they are in college, training and beyond. Adult social care and health services must work closely with the young people during the transition years, to avoid unnecessary and repetitive assessments. Adult needs assessments must take place to ensure services and support can be planned for and appropriately accessed. Support from Hackney Ark - Therapy Transition will help young people in know to the therapy services (and their families) to plan and prepare for moving on from children’s therapy services. Hackney has a aocial aorker within it's Integrated Learning Disabilities Service who works only with adults with autism who do not also have a learning disability but who may have social care needs. He can support with transitions for young people as they near the age of 18 and transfer into adult social care or other adult services. A "supportive tool" has been designed by the Department for Education (DfE) to help think and plan for the four Preparing for Adulthood outcomes as part of EHC planning across all the age range from Early Years onwards. The Preparing for adulthood pathways maps (the illustrated maps at the tops of the Preparing for Adulthood pages) are from an older document but can still be used to help improve planning, prompt discussion and support young people and their families in thinking about what is “important to” and “important for” them as they move into adult life.